As we detailed in our iPhone X vs. Galaxy Note 8 comparison in November, Apple's use of iPhone's earpiece speaker to output stereo sound gave the handset an edge against Samsung's phablet. With the launch of the Galaxy S9 and 9 Plus, Samsung is punching back with its own dual speaker configuration identical to that of the iPhone X. Even with a high quality microphone, it's hard to perfectly capture audio as you would hear it holding the phone in your hand. In our tests, we found the iPhone X reproduced a full range of tones with clear mids that beat out Samsung's S9+. Bass reproduction was similar on both handsets, but the iPhone output sharper high tones, which may or may not be a good thing depending on your preference. Overall, the S9+ is a bit louder, though it's hard to tell in the video since a good chunk of the extra volume comes from the down-firing loudspeaker as opposed to the earpiece. This arrangement is similar to Apple's iPhone 7 and 8 models, whereas the X uses its speakers more evenly. This is the closest speaker comparison we have ever run, and both setups sound really great for smartphones. Seriously a speaker comparison on 7mm thin one thousand dollar phones? I mean like you could count on the fingers of one hand how many people care. I am one of them. So count me in as I care a hell lot about it. The quality of sound from my iPhone X speakers is great. Admittedly, I rarely use iPhone's speaker to listen to music like there were 2 occasions so far since I got it on its launch day, that I fired them up to full volume when I was in remote area, didn't have access to any of my headphones, car's speakers, or anything else and I had to listen to the music. I often listen to my X as I'm going to sleep, so music/movie audio quality is important to a certain extent. As long as I can listen to baseball games on it, I'm good. And I’m betting the music used to for the test was today’s typical loud rock with almost no dynamic range, loud all the time. I WAY care about speaker quality! I watch tons of YouTube (and other) videos, along with listening to lots of podcasts. The speakers in the iPhone X sound FANTASTIC at moderate to low volume levels...plus get loud enough to listen to a podcast with the phone in my pocket. 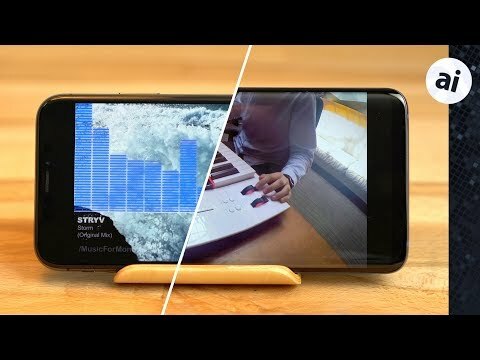 Until the new Samsung S9/S9+ phones came out, if I was looking to purchase an Android phone the lack of stereo speakers would have been a dealbreaker for me. So you'd making a purchase decision between the Galaxy or the iPhone X based on this? The reason you don't see this type of comparison very often in the tech press is because it's in Apple's favor, thus irrelevant. It's like the SoC comparisons where Apple has a definite advantage and the claim is that nobody is really going to notice in daily use. For starters, the intersection of buyers considering a Galaxy S9+ or iPhone X is already ridiculously small. It's even smaller when you include any of these information AI articles as a source of consideration. Personally, I enjoy these comparative articles. If you (and others) don't then why go the forum section of the article to comment at all? I say this as someone who has no intention of buying either of these devices, and likely will never buy a Samsung phone for personal use, and yet I enjoy the efforts of these articles to compare features. If I had one request, it would also be to compare YoY iPhones, but there are plenty of other YouTube videos that do that so while I'd like AI to put their flare on it's not like I'm without other sources to get ballpark estimates and ranges as to how components have improved (or differ from competing devices). Anecdote: Someone I know had an iPhone X speaker that didn't sound as loud as they expected it to (mostly for speaker phone calls). I had no idea what it should sound like and until yesterday I didn't know of a link I could send them so they can could test it against there device. I set up an Apple Store appt. for them, which was conveniently located (but that isn't always the case), and they replaced the device because there was something wrong with the device. This video would've probably saved both of us some time. Notwithstanding iTunes music downloads are sabotaged via data reduction, the tracks are being replayed on bloody telephones, not the centrepieces of some audiophile set-up. You people, you are crank's, get over yourselves.